Lost World Hotel, that's the place where we have stayed during the 2D1N trip to Lost World Of Tambun, Ipoh. It is located just a stone throw away from the Lost World Of Tambun theme park and it's certainly perfect to stay in especially if you wish to enjoy the best of Lost World Hot Springs & Spa at night. It consists of 174 rooms where guest can choose to stay at a selection of room categories which come inclusive of two breakfast and two tickets to Lost World Hot Springs & Spa by night. Uni and I stayed in the same room for the night and we're loving and satisfied with our room! We love how spacious the room is, two relatively huge and comfortable single beds and most importantly, FREE Wifi are available too! There's coffee tea making facilities, flat screen TV that comes with in-house movie channel in our room. Though I think it would be great if the TV wasn't placed in there for the convenience of guest who wish to do some work with a laptop on the table, maybe it's just me. There's no bathtub but there is a separate shower cubicle in the toilet. The shower cubicle completes with shower gel and hair shampoo too. Basic toiletries in the bathroom prepared such as towels, face cleanser and moisturizer, toothbrush and toothpaste, glasses and tissue papers. Both of us didn't bring our toothpaste and felt relief to see toothpaste in the bathroom! The hotel itself overlooks the Lost World Of Tambun theme park that allowed us to enjoy a spectacular view from our hotel. Look at the theme park surrounded by the green lush hills, beautiful! We were so tired after the treasure hunt game and ended up dozed off and napped for another 2 hours before get ready for dinner and spa by the night time. BOOK A ROOM NOW! 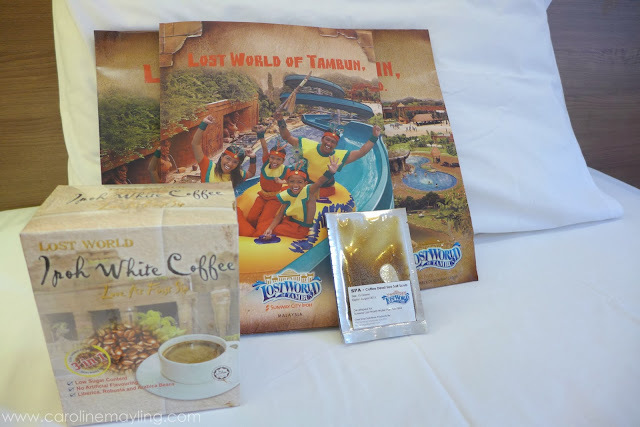 Thank you Lost World Of Tambun for the goodies bag!